The Maldives are the home to the largest population of manta rays in the world. Athuruga and Thudufushi are close to some of the most famous manta-points in the Ari Atoll. The manta season starts in December / January with the arrival of the winter monsoon and ends in April with the arrival of the summer monsoon. Occasionally you may encounter some manta rays during the summer season. 45 minutes away from both Thudufushi and Athuruga, south of Moofushi Island it is currently the best place to see the mantas in our operations area. It is a clean station located in s the outer edge of the pass. In addition to mantas you can often see gray reef sharks, jack fishes and more . 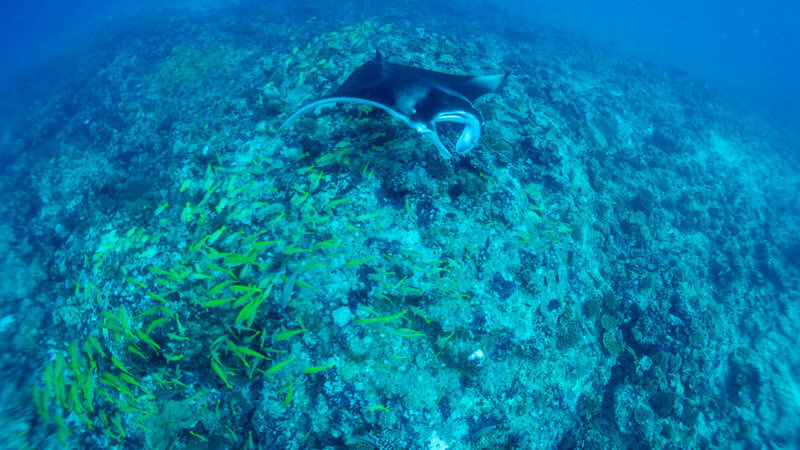 Manta Trust wrote a code of conduct to be respected when we meet mantas while diving. Their Marine Biologists accompany us to the manta-points get the Manta-IDs by take pictures of the belly of the Mantas. You can participate by taking pictures of the belly yourself and with little luck you can find a new Manta and name it.